Al switches the TV on. Now wouldn't it just be awesome if a couple of us here on the forum, joined in with Al to watch Hondo this Friday, February 18th?! We could have a little "chat" and discuss the movie once we've seen it. We don't have to see it at the same time, since it could be hard to set a time due to the time difference around the world. But we could make sure we watch it sometime during that day then come on here and discuss it with each other, and so on. We could take pics of our TV with us watching it. Those who want to can wear their Polk High or NO MA'AM t-shirts. If you don't already own the movie, go out right now and buy it! Or you could Netflix it, watch it online or download it. Your choice. I'm ordering my copy right now and will arrive in a day or two. 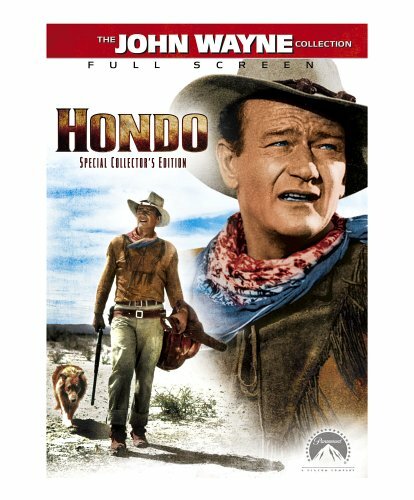 Also, as an extra, we could watch the two episodes where Hondo is mentioned, (2-22, 8-24.) If some members here would like to watch the movie but can't get have access to it, you could always just watch these two episodes instead. So, who's up for this? Come on guys, it's one of Al's biggest dreams and most importantly it's... FOR HONDO!!!!!!!!!!! It's a cool idea; I've never seen the movie. I'll try to track it down. "I want a clean tape of Hondo, Peg." Excellent idea! Now, what shall I include on my snack mountain? Someone set a time, GMT! Great to have two guys on board already! I agree with Marriedaniac, we should set a time when we can try to start the movie. It's a Friday, so we can start a bit later I guess since most are free the next day. You can always watch it before you go out then. Like I said, we all don't have to watch it at a certain time, as long as we all see it sometime during the day. True, true. Looks like my plans have moved to Saturday night anyhoo. Great idea! Count me in! If I can track down the movie! I just ordered my copy! I can't wait. 3:30 Chicago time works for me since I'm in the exact same time zone! This aspect of Al often reminds me of my Dad. He's that same generation, they watched cowboy movies when they were kids and my dad still watches them over and over and John Wayne is huge. My dad will actually use the him as an authority on things. Like for example he would say "The Duke wouldn't put cream in his coffee." "The Duke wouldn't wouldn't order a steak rare." Or the ever present, "A man's gotta do what a man's gotta do." Apparently this movie was originally shown in 3-D and I actually remember once as a kid that there was a promotion, like go to 7-11 and get free glasses so you could watch it in 3-D on TV at home. Well, I thought it was gonna be like a the real movies where stuff is like right in your face but it was more like those comic books you might look at with glasses. LetsRock wrote: Great idea! Count me in! If I can track down the movie! Sweet, get to work finding that copy! Dr. Shoe wrote: I just ordered my copy! I can't wait. 3:30 Chicago time works for me since I'm in the exact same time zone! Awesome! That's the exact same DVD I ordered. Now we're four who'll see the movie on Friday. This is shaping up to be quite an event! Hopefully more will join us. Let us know if you can track down a copy before the 18th. AL SR.	John Wayne thinks you can do it. AL	The Duke? The Duke wants me to do it? AL SR. He's got a five spot riding on ya. AL	Peg. Woman. Pilgrim. Listen up and listen good. Get up, get out, and get my Playboys.